A fashionably dressed woman hurries along during the early morning sunrise. In the background are silhouettes of other people ending their night of entertainment in the theatre district of Edo. 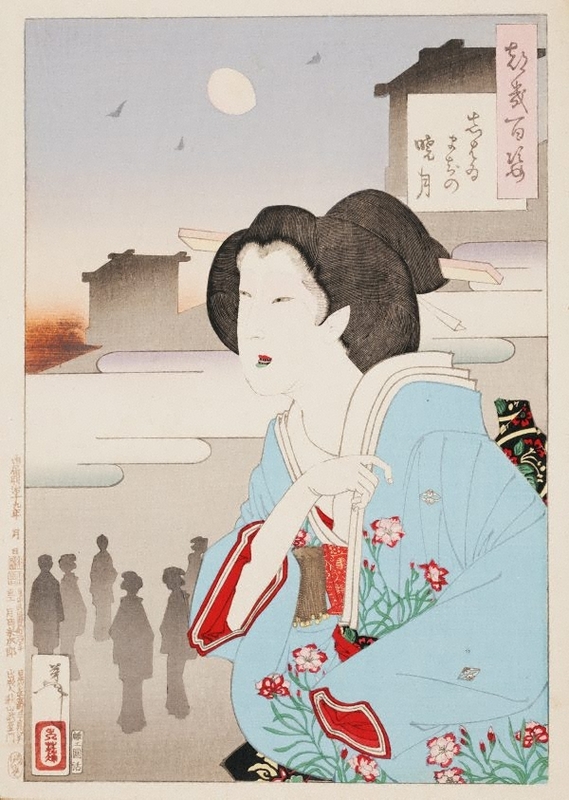 The green of her underlip, often found in 'ukiyo-e' prints and paintings, was derived from applying multiple layers of ‘bamboo-grass-coloured lipstick’. Applied in one or two layers, it appears red, as on her upper lip. The box-like turrets in the background were originally drum towers above the entrances to the kabuki theatres from which announcements were made to attract theatre audiences.